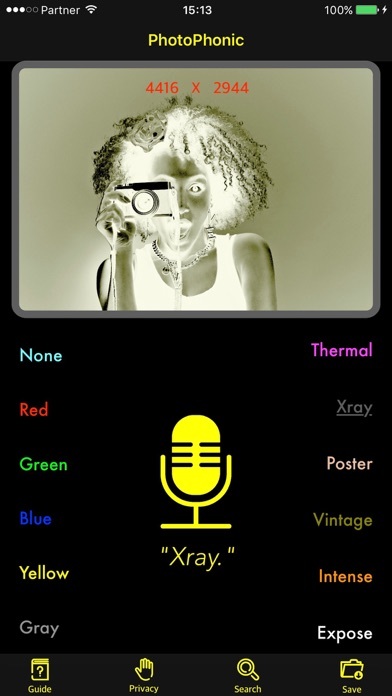 PhotoPhonic bring you both speech recognition experience and new cool photoshop filters. 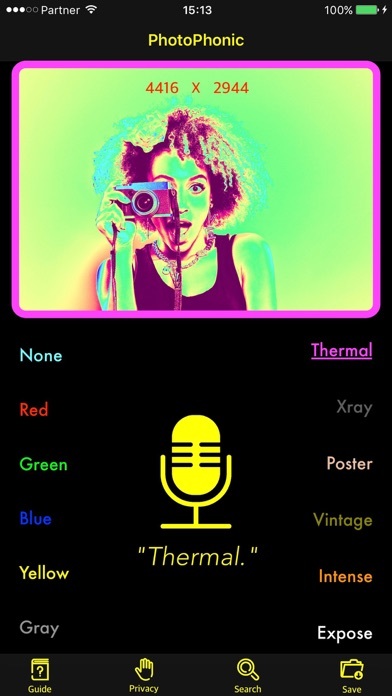 You don't need to press on screen : just speak out a filter name and your photo gets a new exciting look instantly! PhotoPhonic gestures some new filters iOS 10 has to offer such as Thermal and Xray, as well as single-color filters that converts all pixels to a red/blue/green/yellow range. Classic filters are also to be found in PhotoPhonic : Black & White, Vintage, Poster, Expose, Intense. 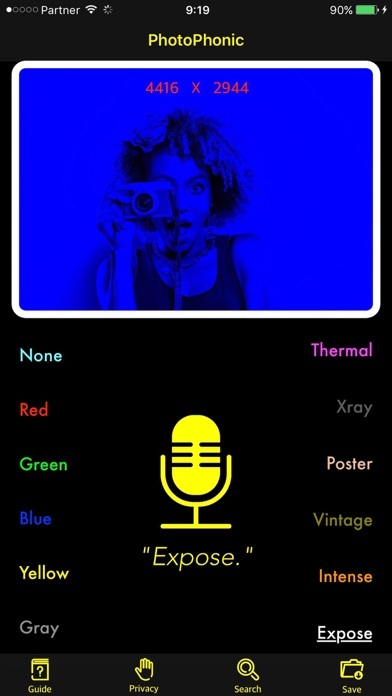 It is possible to apply multiple filters provided you have saved in between (screenshot in blue here is an example of Blue and Expose filters combined) Your voice can control many actions in application, not just photoshop: searching for a picture, saving it, browsing the photo library and opening of other screens can be done by you just uttering the right word. 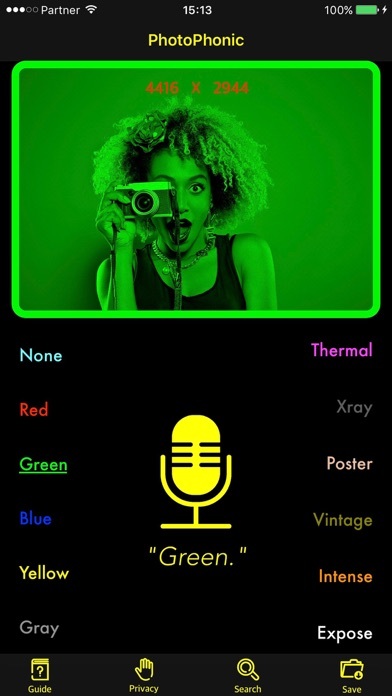 If sometimes you prefer to tap rather than speak -PhotoPhonic also supports a taping mode for all actions. PhotoPhonic requires iOS 10.0 and above. Devices supported are 5 and above. 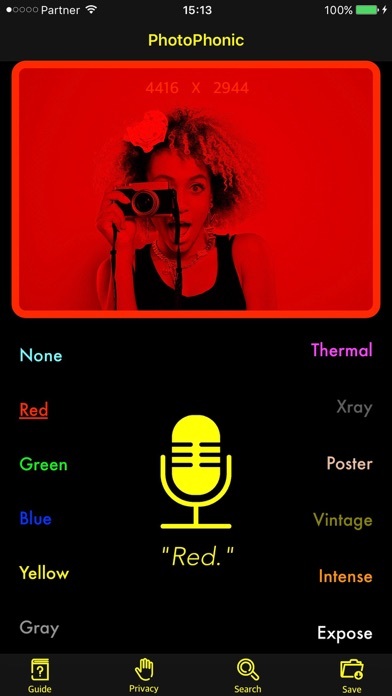 Credits: App Store Screen Shots Photo of girl by izusek from istockphoto (http://www.istockphoto.com/il/portfolio/izusek?mediatype=photography&excludenudity=true&sort=best) Icons In App Microphone icon by Debashis Howlader from iconfinder (https://www.iconfinder.com/Debashis) Magnify search icon, book guidelines icon, hand icon and download folder icon by Crumbs + Pixels from iconfinder (https://www.iconfinder.com/crumbsandpixels) Development, Design & Publish Ethan Halprin.